The Inspired Mic has a new home at the New Europa in the European Village, Palm Coast! The Inspired Mic boasts writers of all genres, magicians, musicians, mentalists, actors, motivational speakers, painters, just to name a few. The write-ups you read on this site were all written by the presenters as a way for you to get to know them. The New Europa has the perfect atmosphere for an event like The Inspired Mic. Cozy. Intimate. A creative flair. The New Europe will host us Thursday, April 28th at 6:00pm. Pick your tickets up now, because they are $10.50 in advance, $15 at the door! Simply click – The Inspire Mic! 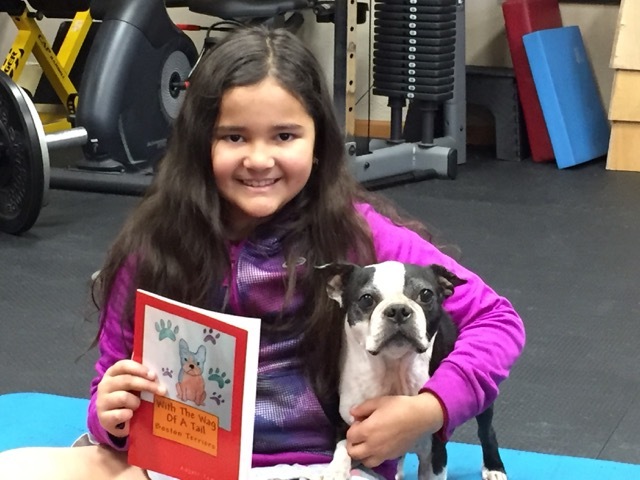 Anjali Anabel Tomerlin is an ambitious and optimistic nine year old, who is passionate about writing and animals. She lives in a quaint beachside town in Florida and is also a nature lover. Anjali is considered to be “one of the youngest published authors in Flagler County, Florida”. She published her first book “With The Wag of A Tail: Boston Terriers” at the age of nine. Her book is available on amazon.com. Within two months of its release, her book sold more than 100 copies! This book is the first in a series, with each book based on a different breed of dogs. She attends Imagine School Town Center and also her mom’s Kumon Math and Reading Center in Palm Coast, Florida. She enjoys taking piano and tennis lessons. Her hobbies include reading, gardening, swimming, building robots, and assembling large (500+ pieces) puzzles. She aspires to become a veterinarian when she grows up. Anjali was invited as a guest at the “Get Published Series” workshop” in Palm Coast, Florida. She has participated in several book-signing events locally and has donated a percentage of the proceeds to her school and local charities.